Die Republik Österreich ist ein Bundesstaat in Mitteleuropa. Es grenzt im Norden an Deutschland und Tschechien, im Osten an die Slowakei und Ungarn, im Süden an Slowenien und Italien und im Westen an die Schweiz und Liechtenstein. The Republic of Austria is a landlocked country in Central Europe. It borders ► Germany and the ► Czech Republic to the north, ► Slovakia and ► Hungary to the east, ► Slovenia and ► Italy (including its autonomous regions of ► Friuli-Venezia Giulia and ► Trentino-Alto Adige to the south, and ► Switzerland and ► Liechtenstein to the west. Its capital city is Vienna. More images Austria - Austria (Category). This section holds a short summary of the history of the area of present-day Austria, illustrated with maps, including historical maps of former countries and empires that included present-day Austria. Map showing the pre-Migration Age distribution of the Germanic tribes in Proto-Germanic times, and stages of their expansion up to 50 BC, AD 100 and AD 300. The extent of the Roman Empire in 68 BC and AD 117 is also shown. Das Römische Reich im Jahre 50 v. Chr. The division of the Empire after the death of Theodosius I, ca. 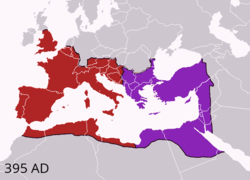 395 AD superimposed on modern borders. Die Teilung des Römischen Reiches rund dem jahre 395. The same map in German. The (Habsburg) Empire of Charles I/V. Aftermath of the Austro-Prussian War (1866). In 1867 the Austrian Empire was continued by Austria-Hungary, making both Austria and Hungary constituent monarchies. Austria became an independent country after the dissolution of Austria-Hungary. This map shows the claims of German-Austria in 1918. The red lines are the real borders realized and presently. Administrative districts in territories under the control of Nazi Germany in 1941. Eastern front of the Second World War circa 1941-1942. Satellitemap of Austria Landsat with boundaries of the "Bundesländer"
Satellitemap with boundaries of the "Bundesländer"
Satellitemap with boundaries of the "Grosslandschaften"
This page was last edited on 3 June 2016, at 23:22.